The Quality Control Department is responsible for the inspection of incoming goods, in-process testing and for finished goods inspection. 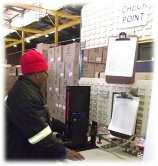 This is done to ensure the maintenance of quality standards throughout the manufacturing process. Various gauges are used to ensure that all products are tested during production. Quality control inspector - testing packaging caps with gauge to ensure proper fit. 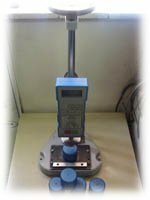 With a recently refurbished laboratory DPE is capable of flow meter testing. We conduct cycle tests to ensure our products will not fail when in the market or in your home. Force gauge testing - to ensure pull and push force measurement for all caps. All material is identified to ensure trace- ability and to ensure that the status of any product or material is easily established. DPE products and services are identified and monitored to ensure that they conform to specifications and customer requirements. DPE sources raw materials from internationally and local reputable suppliers. All component suppliers must conform to at least ISO standards of quality. Each one of our suppliers is audited by DPE at least every 5 years to ensure that our suppliers are complying to local legislation as a minimum requirement. In accordance with our Company Policy and vision, it is DPE's stated intention to procure materials, produce products and provide a service to our customers, which meets their requirements, and expectations. All details and procedures are documented, and regularly reviewed to ensure adequacy, suitability and effectiveness, and thus ensuring full optimisation and utilisation of our assets.